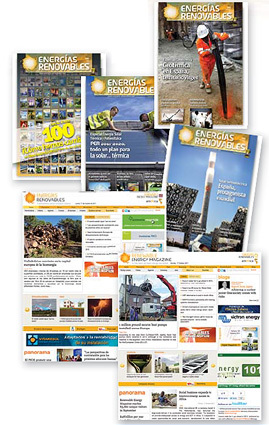 Energías Renovables is the leading clean energy publication in the Spanish language. It has a print version and three online magazines updated on a daily basis. 10 issues per year mailed out to over 4,000 subscribers. There is also a PDF version. In English, offering different content to ER prepared by journalists all over the world. REMalso distributes four newsletters covering different technologies. In Spanish. It focuses on the whole American continent and offers its own content. It also issues a weekly newsletter. Renewable Energy Magazine is committed to upholding the highest standards of publication ethics and takes all possible measures against any publication malpractices. Plagiarism is strictly condemned and any articles found to be plagiarized will be removed or not published in Renewable Energy Magazine. Writers submitting their works to Renewable Energy Magazine for publication as original articles attest that the submitted works represent their contributions and have not been copied or plagiarized in whole or in part from other works. The writers also acknowledge that they have disclosed all and any actual or potential conflicts of interest with their work or partial benefits associated with it.